Why do dogs chew their own feet? If you've ever witnessed your own dog cause themselves significant stress or physical harm as a result of self-inflicted actions, you'll know that our canine friends can sometimes be the cause of concern and worry when they develop a behaviour pattern that is self-destructive. When it comes to dogs chewing their feet, this is a not all too uncommon problem, but one that does require intervention and understanding. In this feature will examine the various causes that lead dogs to chew their own feet and give you some solutions to try to help you identify the route cause of why your dog is chewing his feet and ways to help you help them to stop. Dogs chew their feet for a variety of reasons. Some dogs tend to lick themselves obsessively to alleviate itching whilst others chew their feet or obsessively lick as a result of a behavioural pattern. Conditions such as separation anxiety, canine compulsive disorder (CCD) or simple boredom or stress can be primary causes of feet chewing in dogs too. It's important to intervene if your dog is chewing their own feet as they can cause themselves significant physical damage, which can lead to infection, but more pertinently a dog chewing their own paws is demonstrating an undesirable behavioural pattern, the underlying cause of which we should be committed to solving. Is your dog suffering with a skin allergy or do they have itchy skin as a result of a food allergy? Canine compulsive disorder is extremely rare. It is thought that less than 3% of all dogs have it, but you should seek the advice of a suitably qualified professional to find out if there are underlying problems causing your dog to chew their own feet. By far one of the most common causes that lead to dogs chewing their feet. Boredom is a serious problem and requires owners to work on daily plans to ensure the dog is properly stimulated, both mentally and physically. Having established the primary cause of why the dog is chewing their own feet, you can begin to work on the solutions. If boredom is the cause, work hard to fill the dog's day with interesting tasks and challenges. Interactive dog games such as hide and seek, fetch or simply training the dog to learn new behaviours is both mentally and physically stimulating. Separation anxiety: If separation anxiety is the cause, you need to address the problem head on. Separation anxiety i dogs is increasingly common. Read K9 Magazine's guide to dealing with separation anxiety for advice on how to cure it. Food allergies: If your dog has an allergy that is causing them to gnaw and chew their feet, you should get a professional diagnosis from a vet or nutritionist. Switching food will normally be the first change to make when treating allergies. If your dog is causing damage to their feet, see a vet without delay. Dogs are capable of inflicting serious injuries upon themselves either through scratching or chewing themselves. These wounds can become infected and can develop in to much more serious problems. C) Switch your dog's diet (under veterinary supervision) or general daily routine. A dog that licks or chews on itself is manifesting stress or frustration about something. The problem may start because of some frustration relating to environment, but soon develops into a self-reinforcing habit, as the licking or chewing causes inflammation. Further licking or chewing can provide at least temporary relief, but this ultimately perpetuates the problem. A complete veterinary evaluation should precede the behaviour program for rehabilitation. Flea or tick infestation must be ruled out as a cause. Possible allergies also should be considered, as the problem in many self-mutilators stems from food or other environmental allergies. Many practitioners recommend hypo-allergenic diets, even in the absence of clinical symptoms, as a matter of "insurance." Corrective measures must consider the environmental factors that bear on the problem. However, a general plan involving nonphysical, off-leash training and stabilization of the owner-pet relationship provides satisfactory results. Owner leadership is established by withholding petting and praise, except when the pet responds to some directive from the owner. Stress is the body's response to any physical or mental demand. The response prepares the body to either fight or flee. It increases blood pressure, heart rate, breathing and metabolism, and there is a marked increase in the blood supply to the arms and legs. It is a physiological, genetically predetermined reaction over which the individual, whether a dog or a person, has no control. Your dog experiences stress during training, whether you are teaching him a new exercise or practising a familiar one. You should be able to recognise the signs of stress and what you can do to manage the stress your dog may experience. Only then can you prevent stress from adversely affecting your dog's performance during training. Stress is characterised as "positive" (manifesting itself in increased activity) and "negative" (manifesting itself in decreased activity). Picture yourself returning home after a hard day at work. You are welcomed by a mess on your new, white rug. What is your response? Do you explode, scream at your dog, your children and then storm through the house slamming doors? Or, do you look at the mess in horror, shake your head in resignation, feel drained of energy, ignore the dog and the children and then go to your room? In the first example, your body was energized by the chemicals released into the bloodstream. In the second example, your body was debilitated. Signs of either form of stress in dogs are muscle tremors, excessive panting or drooling, sweaty feet that leave tracks on dry, hard surfaces, dilated pupils and, in extreme cases, urination or defecation, usually in the form of diarrhoea and self-mutilation. Behaviours such as pushing into you or going in front of or behind you during distraction training are stress related. 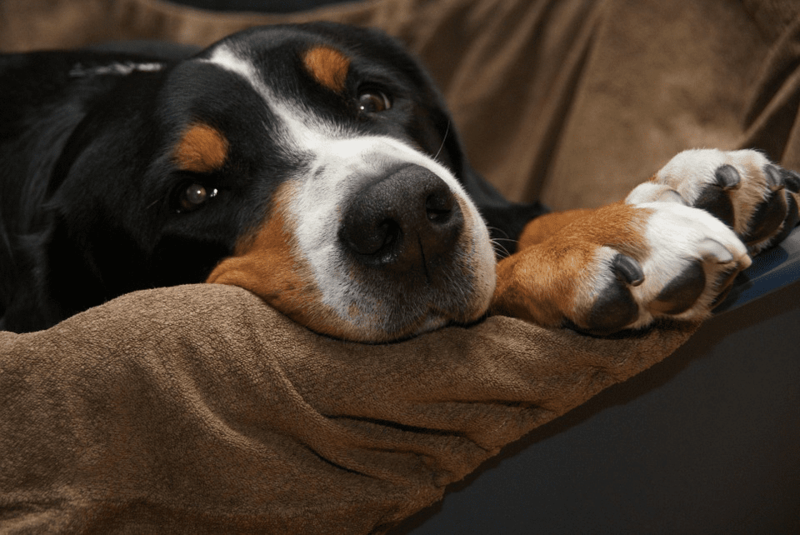 Why do dogs chew their paws: A summary: If your dog is chewing his or her feet you have to find out for certain what the underlying causes are. It could be your dog is stressed about something, perhaps being separated from you - even for short periods - leads them to self mutilate. It could be a dietary imbalance. Your dog may be suffering from allergies from external sources (fleas, worms, parasites, dust). Your dog may be experiencing periods of boredom and is unfulfilled mentally and physically. Ultimately you need to seek the advice and insight of an expert, identify the cause of their foot chewing and then put in place a solution that can disrupt the behaviour. Our dog was chewing his feet non stop and I had no idea it was allergies until we went into a natural pet foods store in our area and talked to the manager. She immediately thought it was allergies and recommended we change the food to something specifically to stop symptoms, that only had sweet potato & chicken in it and nothing bad like wheat, corn, soy, etc. The Natural Balance food is still what he eats today and I haven’t seen him lick his paws since we switched. My dog is constantly chewing on her back paws. Please tell me what the name of the food you now feeding your dog? Thank you so much..
Did Lois get an answer to the November 23,2015 request for the name of dog food made with chicken and sweet potato? Our dog has been chewing her paws for some time now, the vet has had her on Benedryl and antibiotic. Has not helped and our dog is limping more now than before. Please let me know if you have the brand for the chicken and sweet potato food.